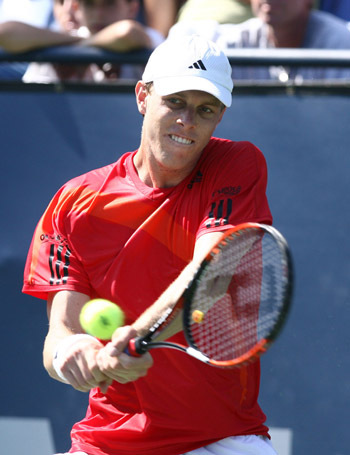 LOS ANGELES - Sixth seed Sam Querrey of Thousand Oaks, CA advanced to the quarterfinals at the LA Tennis Open beating fellow American Ryan Sweeting 6-3, 6-7, 6-3. Querrey seems to be coming into his own as he continues to climb deeper into main draws. Qualifier Ryan Sweeting, originally from the Bahamas, gave Querrey all he could handle. 22 year old Sweeting was a US Open Jr champion in 2005. Sweeting had strong moments but was only able to execute his aggressive attack in the middle set. He kept Querrey on the defensive but couldn't sustain it. Querrey's solid serving in the third set pulled him through. Querrey carries his 6' 6" frame effortlessly and appears to take less risks than his opponents. He is ranked #4 in the US. He is 21 years old and could potentially be the next American star. Earlier this month he reached the finals at the Indianapolis Tennis Championships and the Hall of Fame Tennis Championships in Rhode Island. Mardy Fish, another American, faced wild-card Chris Guccione of Australia. Guccione came prepared to battle service games. One serve from Guccione was read at 141 MPH. Fish kept his score close. He overcame three match points in the second set to win 6-7(3) 7-6(12) 6-4. Fish's next opponent is Leonardo Mayer of Argentina. Eleven Americans started the tournament. John Isner is the third USA player left in the quarterfinals. Yesterday, Isner sprained his ankle while playing Marcos Baghdatis. He worked out today and is scheduled to play at noon against qualifier Carsten Ball (AUS) who resides in Newport Beach, CA. The LA Tennis Open Presented by Farmers Insurance has been played every year since 1927, making it the longest-running annual professional sporting event in Los Angeles. Played since 1984 at the LA Tennis Center on the campus of UCLA, the tournament is part of the Olympus US Open Series, the six-week summer tennis season linking 10 ATP World Tour and Sony Ericsson WTA Tour events to the US Open that in 2008 drew a record of more than 50 million television viewers. Proceeds from the LA Tennis Open benefit the grassroots programs of the non-profit Southern California Tennis Association (SCTA) and UCLA. The SCTA offers programs, leagues, and tournaments involving 300,000 juniors and 50,000 adults and seniors. Information on tickets and the tournament can be found at www.LATennisOpen.com.